Rustburg Correctional Unit opened in 1969 and is a minimum security level 1 high prison located in Rustburg Virginia. This facility houses a maximum of 153 inmates. All offenders at this facility are employed and provide labor for the Department of Transportation cleaning highways and roads. Additional work opportunities for offenders include working in the kitchen and cafeteria, working on a farm and garden crew, providing services in laundry, custodial cleaning, barbering, maintenance, and waste water operations. Inmates are secured by a perimeter fence covered in razor ribbon wire. Housing units are secured structures that contain dormitories. All inmates are confined to their dorms by 9pm. To qualify for housing at this facility inmates must not have been convicted of murder, kidnapping, or a sexual crime. Additionally inmates need to have no behavioral issues for 24 months and no history of escape attempts. 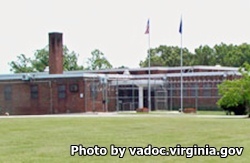 Visitation at Rustburg Correctional Unit is based on a rotating schedule, because of this you will need to contact the facility for the current rotation.